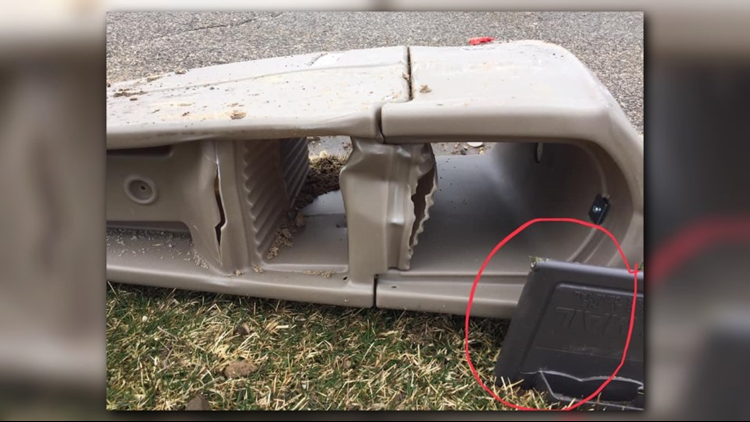 HUDSONVILLE, Mich. — A 39-year-old Hudsonville man has come forward, claiming that he was the person responsibly for damaging dozens of mailboxes over the weekend. A group of Hudsonville residents spent the end of their weekend making police reports, after they said they awoke to find more than 40 mailboxes vandalized outside their homes. The incident happened in the early morning hours on Sunday, near the 36 Avenue and Lenters Road. Ottawa County Sheriff’s Deputies were promptly called to investigate the situation. The sheriff's office says they took 29 reports from neighbors. “They said they had some leads. They think they can figure this out fairly simply. There will be some criminal charges brought and also, because of that, there will be appropriations made to pay back the neighbors and things like that for the damages,” said homeowner, Brian Mattson. Many homeowners took to Facebook to show the vandal’s effect on their property. Todd and Brianna Beilfuss sent 13 ON YOUR SIDE video surveillance from their home that shows the driver circling the neighborhood and plowing the mailboxes down. “I mean I guess you can’t be shocked in this kind of world, but you know it’s Hudsonville. It’s quiet. It’s supposed to be quiet and you know, just a small-town neighborhood,” Mattson said. Mattson shared that this isn’t the first time the surrounding area has seen vandalism. “My son just told me a couple days ago that their elementary school got vandalized, which is just Georgetown Elementary across the street,” he said. However, he doesn’t believe that the driver targeted the suburb for any specific purpose.